Let me paint a picture for all of you. The day is rainy, wet and cool, and my children are cranky and whine at length between coughing jags. The increasingly shorter days coupled with the cloudy sky make the house dark and cool and make my eyes sleepy. I stumble through the kitchen and prepare to make breakfast, tripping over obstacles that have been left in my path by sick but stealthy children. I settle on eggs with cheese, only to find that I have no eggs and similarly, no cheese. 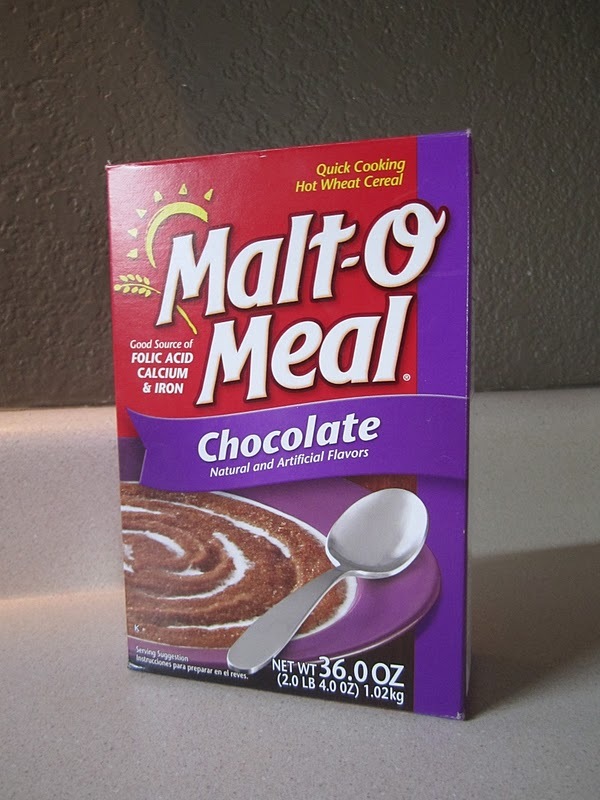 Knowing that they kids have had a lot of cereal this week, I opt to go a different direction and whip up some Malt 'O Meal, a favorite from my own childhood, but one that I don't pull out very often. I consult the serving side chart on the back and decide to make 6 servings for the three kids (mine plus our daytime friend) based on their tendency to gobble down two packets of oatmeal each. I throw it all in a pot and start stirring. Twenty minutes later it has finally come together and I pour it into three bowls as hungry children claw at my legs and gnaw on the counter top. Well, maybe it wasn't that severe, but I do think I saw Graham eat a Cheerio that looked as though it had been on the floor for about a week. I quickly realize that the hot cereal is much too hot, so I toss the bowls into the freezer to cool off. After repeatedly stirring and checking, I pull them out 30 minutes later and finally cool enough to eat. As I stir them one final time, however, I realize that they have stiffened up considerably and need some milk to reach the desired consistency. I thin them out and realize that they are now cold, and I pile them into the microwave to reheat. 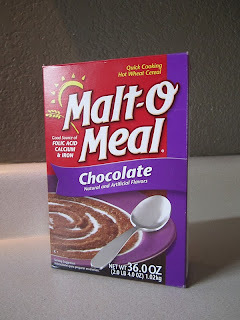 I decide that one minute at a low power level should do the trick, but I forget to enter the power level and the cereals are bubbling when I retrieve them. Fizzling fireboxes. I finally get the cereal debacle under control and place three bowls in front of the boys. I hand them spoons and return to the kitchen to make myself some breakfast. As I fix my plate, I notice that the kids are exceptionally quiet. Too quiet. My first thought is that they are really enjoying the chocolate cereal and are busy enjoying it. But as I turn around, I realize that my hypothesis was true for two out of the three. But Graham has sacrificed his fork to the dog and decided to use his hands to scoop the cereal rather than asking me for another utensil. I quickly grab a washcloth and try to minimize the damage, much like a nurse in a triage station. But instead of bandages and ointments, my tool are wet wipes and hand sanitizer, both of which are incredibly useless when your child shoves hot cold hot warm cereal into his ear canal. Or his diaper. Or down my shirt. The morning passes and after lunch the kids are sleeping quietly in their rooms. 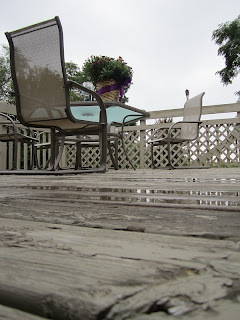 I sit down to check the blog and gasp with the realization that not only do I have nothing prepared, but the boys' sickness has led to very few funny moments and very many new gray hairs on my head. I read through comments, hoping that one may trigger an idea for today's post. 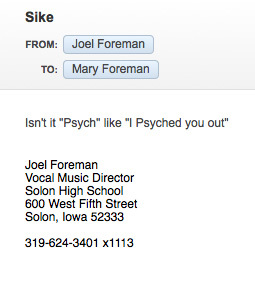 Instead I find that I have received SEVEN emails from people correcting my use of the word "sike" and instead suggesting that it should be "psych". 'Fraid not, my friends. I actually researched it before posting and found that every single '80s slang site uses the spelling I chose. At the time, I thought the people running those websites must be incredibly nerdy with virtually no social life. Now I realize that by sharing these thoughts with you, I am inextricably linked to those nerds. But I am so active on the social scene and am not at all geeky! So forgive me for today's "non-post". I'm sure it won't be the last of it's kind, but I promise to return on Monday with a refreshed attitude, healthy children and a wealth of stories to share. Hope the kiddos feel better soon! Pavi- Thank you. They are finishing up their last day of the oral steroid, so I'm hoping things will improve from here.